SKU: 0 609408 705649. Category: Action, Adventure, All, Creature, Drama, Fantasy. Tags: Action, Adventure, Martial Arts. The year is 1590, the 18th year of the Tensho era. After the demise of warlord ODA NOBUNAGA, Japan is about to be unified by TOYOTOMI HIDEYOSHI. However, one man in the Kanto region defies unification. That man calls himself TENMAOH (Mirai MORIYAMA) and leads the KANTO DOKURO-TO (Skull Clan), an armed group hiding in the pitch-black DOKURO-JO (Skull Castle), though he once worked for NOBUNAGA. 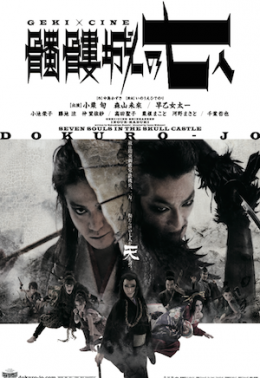 SUTENOSUKE (Shun OGURI) happens to rescue SAGIRI, a woman who has been chased by the KANTO DOKURO-TO and their bloodthirsty leader, madman TENMAOH. To hide and shelter the woman, SUTENOSUKE meets MUKAIYA RANBE (Taichi SAOTOME) at a brothel district. Manipulated by magical fate, people congregate in the Kanto region. When the shared past between SUTENOSUKE and RANBE, and their relation to TENMAOH, come to light, the dark ambition of TENMAOH is revealed. Without regrets, SUTENOSUKE and his seven souls head for DOKURO-JO, though it is surrounded by 20,000 soldiers, to destroy it and stop TENMAOH’s dark ambition. .
2.SINGLE UNIT, PUBLIC & PRIVATE LIBRARY, AND PCAP ONLY AVAILABLE FOR PRE ORDER. DVDs will be sent after theatrical release window has finalized. At this moment ONLY DVD available for this movie.